Life can sometimes be unfair, today you might have it and tomorrow you lack it. Here is a story of an eldoret former powerful councillor at Moi Regime who is now a beggar. Once high flying and vocal politician from Eldoret has been reduced to a pauper. 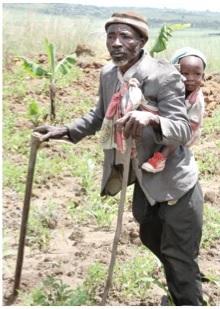 Njoroge Mwangi, who represented Eldoret Ward in the 1990s, struggles to make ends meet in his small farm and most of the time, he lacks even basic necessities. This is the same man who was so powerful and vocal in the 1990s. Back then, he used to rock designer suits but nowadays, he has been reduced to a pauper. 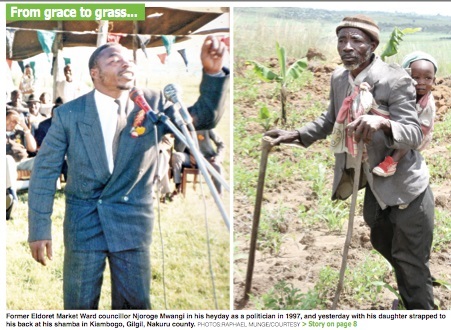 He is now begging from rich people while he used to be rich himself , Njoroge has been reduced to a pauper. The cause of his poverty is unknown but life can be cruel sometimes.